I think uranium is a great buy at these level, there will always be a demand.Especially with nuclear reactors. Something has got to give. Either gold has got to tank in value relative to uranium, or uranium has to soar in value relative to gold. I think uranium had a bubble that burst, and you shouldn't expect anything further from it. There's been a lot of hype about new nuclear power plants being built, but they're expensive compared to natural gas and coal is even cheaper. This chart makes an investment in uranium look as quaint as tulip bulbs. David. I don't know if I can entirely agree with you on that point. China has agreed to puchase from Cameco, 29 million pounds of uranium over the next 10+ years. If uranium were compared to the Dutch tulip craze it would have to be based upon speculative demand. I don't see China, or India, as tulips. Real people, real energy needs, real demand; supply vs. Demand. Oh, and don't forget a current cheap and clean energy source-no greenhouse gases. Did the China purchase make even a bump in the price of Uranium versus Gold? Take a look for yourself. The answer is quite clearly no. And the last thing I would call Uranium is a clean energy source. Rational people choose not to pollute the environment for their great-grandchildren if they can possibly help it. Yes, there are areas of the world that haven't gotten the news that the sun is an abundant source of energy that can be exploited in many ways without destroying the environment, and nuclear power offers false hope, but a few more nuclear accidents and everybody will be on the same page. 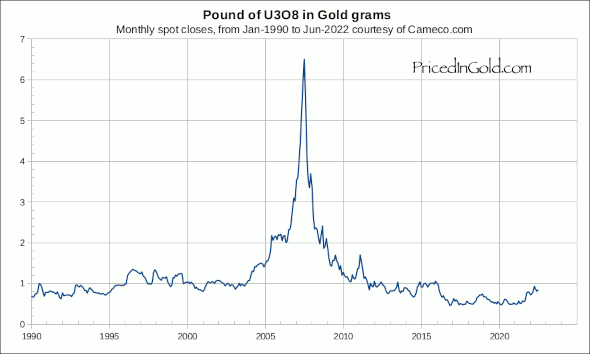 "Did the China purchase make even a bump in the price of Uranium versus Gold?" –> No, why would it? See if the next 5-8 years of Chinese nuclear reactor building and the ensuing electric vehicle revolution do anything to move price. "And the last thing I would call Uranium is a clean energy source." –> What would you call it then? By definition it is among the cleanest energy sources in that it does not produce emissions or byproducts other than the hot isotopes. Compared to coal for base power load, etc. it is the best alternative other than LNG, which could not support large-scale infrastructure the same way or with the same sustainability. Also keep in mind that e.g., solar power produces permanently harmful and costly environmental waste from the solar panel components. Reference what has happened in Germany – the energy to safely dispose of the non-functional panels offsets any 'clean' energy benefit. "Rational people choose not to pollute the environment for their great-grandchildren if they can possibly help it" –> I guess nobody in the world to date has been rational, because the world is polluted to hell from my grandparent's generation and beyond. Most of that pollution is not just nuclear. There is a myriad of pollution sources that have contaminated the environment and people. That ranges from glyphosate (Roundup), to hydrocarbons to fluorene gas emissions, etc. I suggest you encourage rationality without bias. "Yes, there are areas of the world that haven't gotten the news that the sun is an abundant source of energy that can be exploited in many ways without destroying the environment" –> Why don't you take a look at how well solar has worked for Germany. I would like you to explain right here how you can exploit solar without destroying the environment. The solar panels required drain vital resources (e.g., silver), cause collateral in mining operations, pollute being manufactured, contain hazardous materials for the environment if disposed of, and pollute a bunch to dispose of. Also if you cover large areas of the earth in panels or mirrors you mess up the albedo effect. It's clear that your bias towards a pleasant idea is distorting your understanding of science and economics. "nuclear power offers false hope, but a few more nuclear accidents and everybody will be on the same page." –> Nuclear power offers plenty of potential and not just in fission. Check out fusion reactors Mr. Big Shot. I don't think you are more intelligent than fellows like Rick Rule, Doug Casey, LuKas Lundin or Robert Friedland. Uranium is the 7th most abundant mineral on earth and can be reclaimed from seawater using new proprietary technology. It offers the potential for zero emission, sustainable energy with facilities that can often run uninterrupted for 20 years+. If you are seriously naive enough to think that 'a few more accidents and everybody will be on the same page' you clearly have an equally myopic and infantile understanding of human nature.